For 4 people – but easily halved for 2 people. 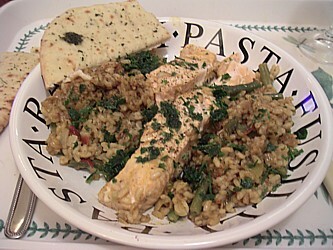 Succulent salmon fillets on a bed of spiced rice, made in a one-pot dish. 2. Add the coconut milk, chicken stock, and curry paste to the pan, and bring to the boil, stirring, until the paste dissolves. Taste for spiciness, and add a little more paste if desired. 3. Add the rice and green beans, and simmer gently for 5 minutes. 4. Stir, then lay the salmon fillets on top of the rice. Cover and cook for 8 minutes, until the fish is just cooked through. [Test after 6 minutes with the point of a knife – cooking time depends on the thickness of the fillets.] The rice should be tender, a rich golden-red colour, and not completely dry. 5. Garnish with the chopped herbs, and serve. Options - some ideas to try! 1. Add 2 lemon grass stalks, finely chopped, to the onion and garlic. 2. Add a small amount of chopped fresh ginger to the onion and garlic. 3. Try other varieties of curry paste. Vary the quantity according to taste.